At Cosmetic and Plastic Surgery of Central Pennsylvania, your skin care consultation is complimentary. Our Plastic Surgeon and/or Physician Assistant will meet with you to evaluate your skin and listen to your concerns about your skin’s condition and appearance. Our MedSpa offers in-depth facial consultations to address your cosmetic needs. Patients receive a VISIA complexion analysis which illustrates patient wrinkles, sun damage, pore size, texture, UV spots, red areas, porphyrins, lash health, as well as "skin age estimate." By using this tool before and after recommended skin regimens, patients are able to truly measure their progress to rejuvenation. In addition to the facial analysis and evaluation, our Physician Assistant also assists Dr. Theodore Foley in the patient consultations for UltraShape Power and VelaShape III. The UltraShape Power and VelaShape III are for fat destruction and cellulite reduction/skin tightening respectively. Your personalized consult will include recommendations for specific in-office treatments as well as daily care products to maintain your results. You will be given a VISIA skin analysis and/or nonsurgical body contouring appointment. SilkPeel Packages Available- $750 Buy 5/Get 6th treatment FREE! Chemical peels provide more advanced rejuvenation and overall skin health improvement with minimal downtime. A chemical peel is a topical skin treatment solution that gently removes the very top layer of skin to promote new skin regeneration. This treatment is commonly used on the face but is often applied to the hands, chest, and neck as well. Chemical peels lighten pigment discolorations, reduce lines and wrinkles, improve acne, and eliminate rough skin texture. We offer several options to suit your aesthetic goals. Our Plastic Surgeon and/or Physician Assistant will determine which peel is appropriate for you during your complimentary consultation. serious skin irregularities like actinic keratosis. UltraShape Power and VelaShape III are optimal nonsurgical treatments for your body contouring needs. These are for patients who do not want to undergo surgery and do not want downtime. Whether you want to eliminate fat, help tighten skin, or reduce cellulite — these are the treatments for you. These noninvasive tools are superior to their competitors like CoolSculpting and SculpSure, which produce less of a result per treatment and can produce significant problems such as pain and/or irregular contours. UltraShape Power uses focused, pulsed ultrasound for fat cell destruction of the abdomen, flanks, thighs, arms, and bra areas. VelaShape III uses radiofrequency, infrared, vacuum, and lymphatic massage to reduce cellulite, tighten skin, and contour the body. It is used on the thighs, abdomen, flanks, arms, bra areas, and neck. A series of three UltraShape Power and/or VelaShape III treatments once every two weeks is recommended for optimal results. Results will begin to be visible in the first week and will be full seen at 8 – 12 weeks after the last treatment in the series. Quarterly cellulite maintenance treatments are recommended for the VelaShape III. Cost is based on treatment area and can range from $1000 – $3600 for a series of three treatments. For more description of each, please click on the links above. At Cosmetic and Plastic Surgery of Central Pennsylvania, we recommend using SkinCeuticals, SkinMedica, and or PCA for all of your at-home skin care needs. The products are clinically tested and formulated to correct signs of aging, protect healthy skin, and prevent future damage. We recommend using the “power of 3,” which includes a topical antioxidant and sunscreen for daytime use and a retinol for nighttime use. SkinCeuticals CE Ferulic, Phloretin CF Gel, and Physical Fusion SPF are patient favorites for their antioxidant and sunscreen protection. 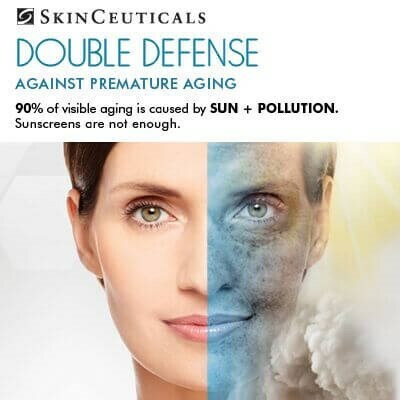 SkinCeuticals' motto of prevent, correct, and protect helps patients maximize at-home skin care. SkinMedica TNS Essential Serum, Retinol, and Eye Repair Cream are our top SkinMedica sellers. TNS is a corrective product that helps rejuvenate your skin with its proprietary blend of growth factors, cytokines, antioxidants, collagen, and proteins. As we age, the production and levels of growth factors in our skin decrease. The growth factors in TNS essential serum are important for overall skin health because they help to maintain a healthy skin structure. Without these growth factors, more lines and wrinkles develop which can make you appear older than you feel. The SkinMedica retinols, which are also patient favorite products, can help to diminish pore size, repair texture, encourage cellular renewal, and minimize wrinkles. The eye repair cream can help reduce the dark circles under eyes and/or the fine wrinkles (depending upon which SkinMedica eye repair product). To maintain and improve skin health, an effective skin care regimen must contain three fundamental elements: Prevention, Protection, and Correction. The SkinCeuticals product philosophy is built around these principles. Designed to prevent future damage, protect healthy skin, and correct previous damage, SkinCeuticals is committed to advanced skin care products that are backed by science. 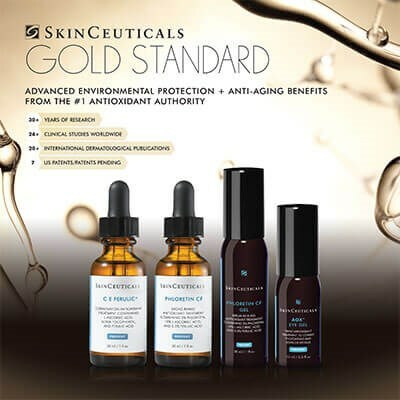 With four generations of topical antioxidant formulations, ten patents, and more than 200 studies published in prestigious medical journals, SkinCeuticals is a trailblazer in antioxidant science. Vitamin C in general helps neutralize free radicals to protect skin from oxidative stress and prevent visible signs of aging. CEF offers 8x environmental protection and anti-aging benefits. Phloretin protects skin from free radical damage and helps regulate pigmentation. These SkinMedica favorites have been clinically proven to help patients with facial rejuvenation, skin texture, and/or skin tone. Patients have visible improvements with facial aging and skin health concerns. At Cosmetic and Plastic Surgery of Central PA, we continuously seek the best treatments and products for our patients with continuing education and new products and services being added as our practice grows. We are excited to announce new services and products coming to Cosmetic and Plastic Surgery of Central PA. A sneak preview of things to come are laser treatments.